Traders work on the floor of the New York Stock Exchange (NYSE) in New York, U.S., on Dec. 7, 2018. Stocks dropped sharply on Friday, concluding what has been a wild week for Wall Street. 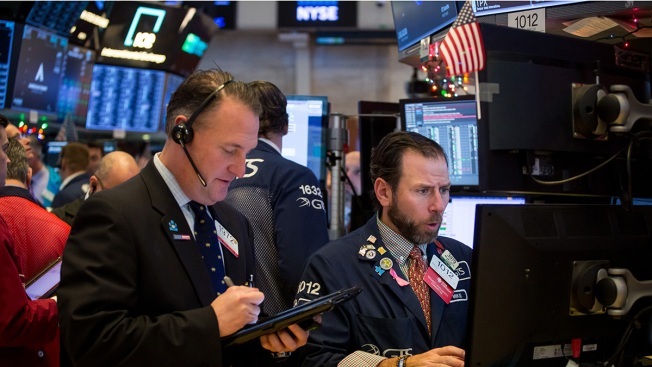 A weaker-than-expected jobs report and China-U.S. trade tensions sent the Dow Jones Industrial Average lower by 558.72 points to 24,388.95 and erased its gains for the year. At one point, the Dow was up more than 8 percent for 2018. The S&P 500 pulled back 2.3 percent to 2,633.08 and also turned negative for the year. The Nasdaq Composite dropped 3.05 percent to close at 6,969.25. Shares of large-cap tech companies led the way lower. Facebook, Amazon, Netflix and Google-parent Alphabet all traded lower. Apple’s stock also fell 3.6 percent — erasing its gains for the year — after Morgan Stanley cut its price target on the tech giant’s shares, citing weakening iPhone sales. For the week, the major indexes all dropped more than 4 percent. Thursday’s session included a violent drop of nearly 800 points, followed by a strong rebound from those levels. This week was also the worst for the indexes since March. Indexes fell to their lows of the day after the Wall Street Journal reported federal prosecutors are expected to bring charges against Chinese hackers allegedly trying to break into technology service providers in the U.S., another negative headline amid tense trade talks between the two countries. The U.S. economy added 155,000 jobs last month. Economists polled by Dow Jones expected a gain of 198,000 jobs. Wage growth also missed estimates. But investors were torn about the data as it could signal fewer rate hikes from the Federal Reserve down the road. Investors worried about the U.S. and China striking a permanent deal on trade after news of the Huawei CFO’s arrest broke. News of the arrest initially sent stocks down sharply on Thursday, but equities managed to recover most of their losses. This also came after President Donald Trump and Chinese President Xi Jinping agreed last weekend on a cease-fire to the ongoing U.S.-China trade conflict, which sent stocks sharply higher on Monday. Trade-related stocks like Deere and Boeing fell 4.6 percent and 2.6 percent, respectively. Caterpillar also dropped 3.75 percent. Investors also grappled with fears of an economic slowdown this week. The yield on the 3-year Treasury note yield broke above its 5-year counterpart earlier in the week, a phenomenon referred to as an inversion. Historically, when short-term yields move above longer-term rates, it signals a recession could arrive in the near future. However, the more closely watched spread between 2-year and 10-year yields has yet to invert. Bank shares fell broadly on Friday. The SPDR S&P Bank ETF (KBE) dropped 1.4 percent. Shares of J.P. Morgan Chase, Bank of America and Citigroup all fell at least 1.8 percent. CNBC’s Silvia Amaro contributed to this report.